Upon my return from the beautiful Italian island of Sicily, I promised I would experiment with baking some Sicilian treats that I could share with you all. Cassata is a traditional Sicilian cake and can be found everywhere on the island, from cafés to pasticcerias to restaurant dessert cabinets. It is traditionally a sponge cake, moistened with fruit juice or liqueur and filled with this cake’s namesake – ‘cassata’, which is a mixture of sweetened ricotta cheese, mixed peel and chocolate (it can be flavoured with vanilla also); and decorated with a layer of marzipan and icing, usually in pastel colours. As you can see from the picture above, mine is far from traditional in the icing stakes! But it’s creamy ricotta filling and fruity flavour echoes its more authentic Sicilian cousin. Line two 18cm cake tins with greaseproof paper and preheat the oven to 180 degrees Celsius (160 degrees for a fan oven). Cream together the butter and caster sugar until light and fluffy. Add the beaten eggs little by little to the butter and sugar mixture, beating thoroughly after each addition. Fold in the orange zest. Sift the flour, baking powder, cornflour and icing sugar together into a separate bowl. Alternately fold a spoonful of the dry ingredients and then a tablespoon of the milk into the sugar and butter mixture until all ingredients are evenly combined. Divide the batter equally between the two prepared tins and bake for 25-30 minutes or until the centre of each cake feels springy to the touch. Leave to cool in their tins for 5 minutes before turning out onto wire racks. When the cakes are almost cold, poke some small holes into the surface of each with a cocktail stick. Drizzle the orange juice, or orange liqueur if you prefer, into each sponge to moisten. Beat the ricotta with the icing sugar until smooth and fully combined. Finely chop the dark chocolate and stir in until the flecks are evenly distributed. Add the vanilla extract and marmalade and stir well. Place in the fridge to chill until needed. Sieve the icing sugar into a bowl. Gradually add the orange juice and stir until smooth and at ‘ribbon’ consistency. This means that when a spoonful of the mixture is lifted and trailed over the icing in the bowl, it will leave ‘ribbons’ on its surface and won’t simply blend in – if it disappears as it hits the icing in the bowl, add some more icing sugar until it thickens to the correct consistency. Place the bottom layer of sponge onto a plate. Spread with a generous layer of the Cassata filling. Carefully place the second layer on top. 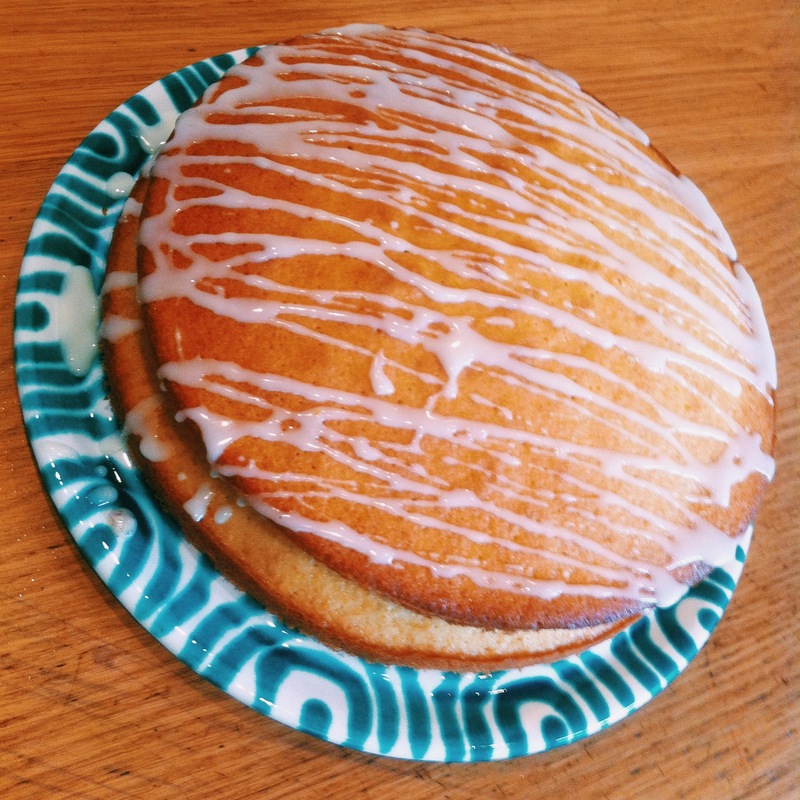 Using a metal spoon, drizzle the orange icing onto the cake. 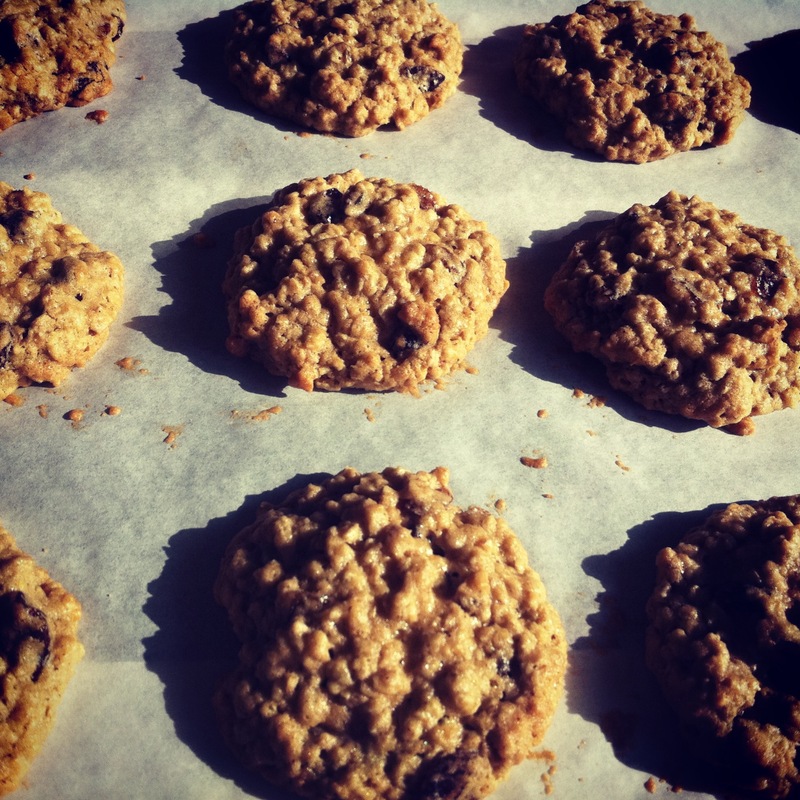 Oat and Raisin Cookies: Naughty but Nice! I had the baking bug this morning and whilst clearing away the breakfast things I got a sudden craving for these sweet but wholesome, soft-in-the-centre-but-crunchy-around-the-edges cookies! I owe the inspiration for these to one Mark Lambert, a member of the Harlequins Rugby Club, whose offering was part of a feature in the Easter ‘special baking’ issue of Delicious Magazine (April 2013). It’s one I flick through often (for obvious reasons) and these caught my eye as they are super-quick and easy to make – and they turned out beautifully. My recipe is for double quantities and I have exchanged the light brown sugar for the more toffee-y dark soft brown, which adds to their caramel flavour. 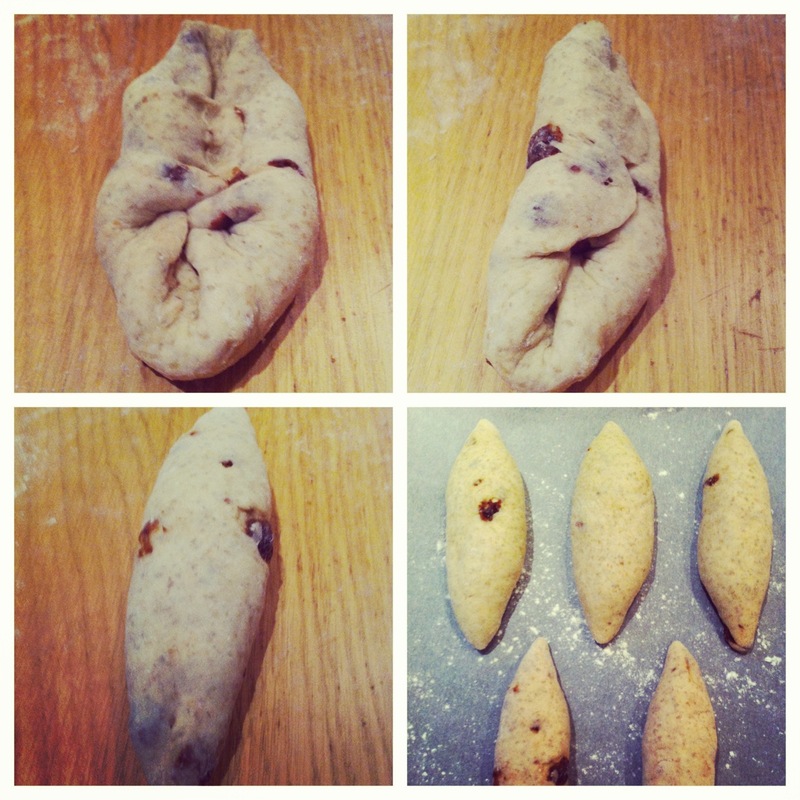 I like to freeze half the dough, then I can rustle up freshly baked cookies in a flash whenever I fancy them! Beat the butter, sugar, eggs and vanilla extract together in a large bowl, until well combined. In another bowl, mix the flour, bicarbonate, mixed spice, salt, oats and raisins together, again until well combined. Pour the dry ingredients into the egg mixture and mix thoroughly until there are no traces of dry flour in the mixture and the oats and raisins are evenly distributed. Tip onto a large piece of cling film, wrap tightly and place in the fridge for 15-20 minutes. Preheat the oven to 180 degrees Celsius and line two large baking trays with greaseproof paper. Once the dough has firmed up in the fridge, dollop small balls of cookie dough roughly 5cm apart onto the prepared trays. I use my tablespoon measure for this as it makes them all of a similar size, which means they cook evenly. I fill it generously (so each cookie is a heaped tablespoon) and then ease each one out with my finger onto the tray. Bake for 10-12 minutes until the edges have turned golden but the tops still look slightly under-baked. They will firm up as they cool and become wonderfully soft and chewy! These rich, buttery, rice-filled pies are a Finnish staple. They originated, as their name suggests, in Karelia (Karjala), a region of eastern Finland; where my partner Jani grew up. Now they are in every Finnish supermarket, sold both fresh and frozen, and are eaten for lunch or as a snack topped with anything from the traditional ‘egg-butter’ or munavoi, to ham, cheese or just a thin layer of unsalted butter. There are two traditional fillings: rice, as my recipe contains, or mashed potato. If you have some left over mash, whip in some extra butter and salt and use it to fill these crisp, wholesome pastry cases – another delicious way to eat these! When I first came across karjalan riisipiirakat, on holiday in Finland, I found it really strange eating pastry with a starchy filling topped, as if it were bread, with ham or cheese. Jani maintains that because of the harsh winters in Finland they needed as many calories and as much energy as they could cram into one small pie, and this is how Karelian Pies came about! I don’t know, but they certainly taste amazing and add some extra sustenance to lunchtime if there are slim-pickings in the fridge. Line two baking trays with greaseproof paper. Start by making the filling. Place the rice in a saucepan and cover with the water. Bring to the boil and simmer for 5-10 minutes. Add the milk and continue to cook over a low heat for 30-40 minutes until most of the milk has been absorbed and the mixture has the consistency of thick rice pudding. Don’t forget to stir occasionally, as the rice may stick if left untouched. Add the salt and stir well before setting aside to cool whilst you make the pastry. Put the rye flour and salt in a large mixing bowl and add the oil. Gradually add the water, mixing by hand until the ingredients come together to form a dough. Tip the dough onto a lightly floured surface and roll into a long sausage shape. 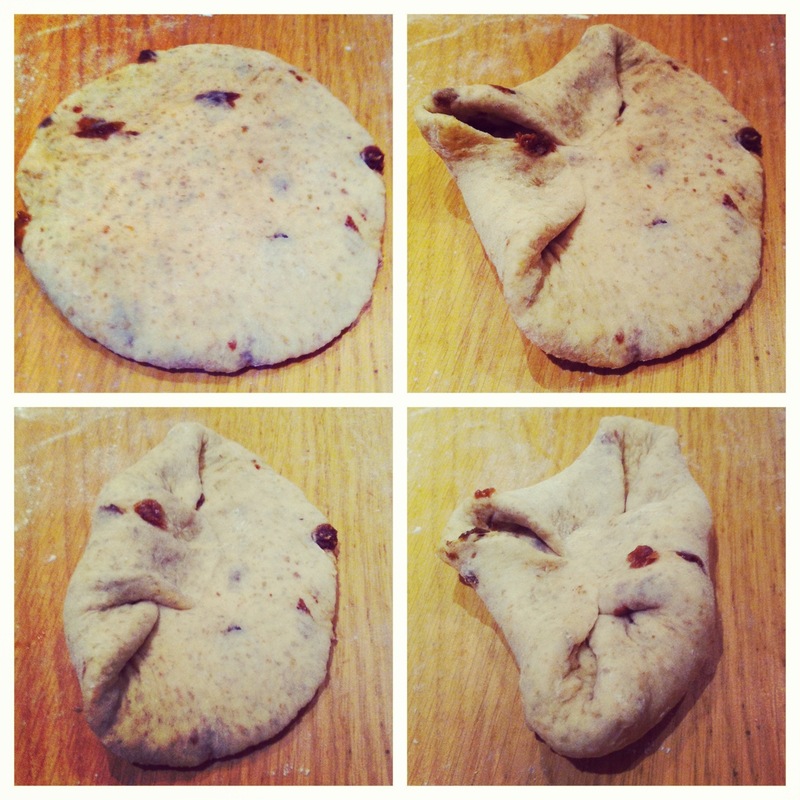 Using a Scottish Scraper (or a large knife), divide the dough into 20 pieces and roll each piece into a ball. Using a floured rolling pin, roll each into a thin round, roughly 10cm in diameter. Place two tablespoons of the rice filling into the centre of each round, leaving about 2cm of pastry around the edge. Using both hands, begin to lift the edges of the pastry in towards the filling and pinch together with your thumb and forefinger. 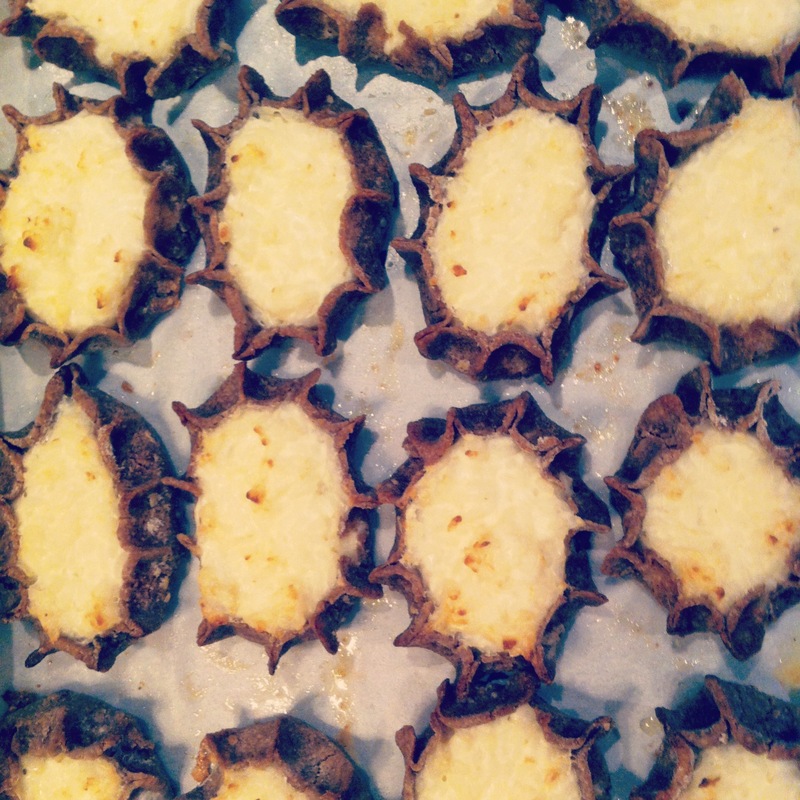 Repeat this until the edges of the pastry are upstanding and are encasing the filling (see picture above). Pour the melted butter into a wide shallow bowl (I used a large Tupperware tub for this), and, using a slotted spoon, lower each pie into the butter so it is fully immersed, then place on one of the prepared baking trays. Bake in the preheated oven for 15-20 minutes until golden brown and crispy around the edges. The idea for this post was inspired by two pages in Richard Bertinet’s ‘Dough’. The two pictures (found on pages 18 & 19 of the book), juxtaposed, look fairly similar bar the uniform pappiness of the supermarket ‘sliced-white’, and need no further explanation besides two lists of ingredients. One contains four natural constituents: anyone who has made bread at home will know these are flour, yeast, salt and water; the other looks like the contents of a chemist’s cabinet: mono- and diacetyle tartaric acid esters of mono- and diglycerides of fatty acids, to name just one of the many ‘E-numbers’ it comprises. As well as arousing a glimmer of a self-satisfied smirk as I considered which home-baked, Bertinet influenced loaf I would conjure first; I was also driven to find out more about why these Frankenstein loaves have long been Britain’s favourite – accounting for over a quarter (£920 Million) of the UK baked-goods market, in 2012. Well, we can blame the ‘bread-scientists’ at the Chorley Wood Flour Milling and Bakery Research Association Laboratories (doesn’t sound like a place I would want to be responsible for something I eat every day! ), the work of whom, back in 1961, led to a revolutionary new way of producing bread – The Chorleywood Process. 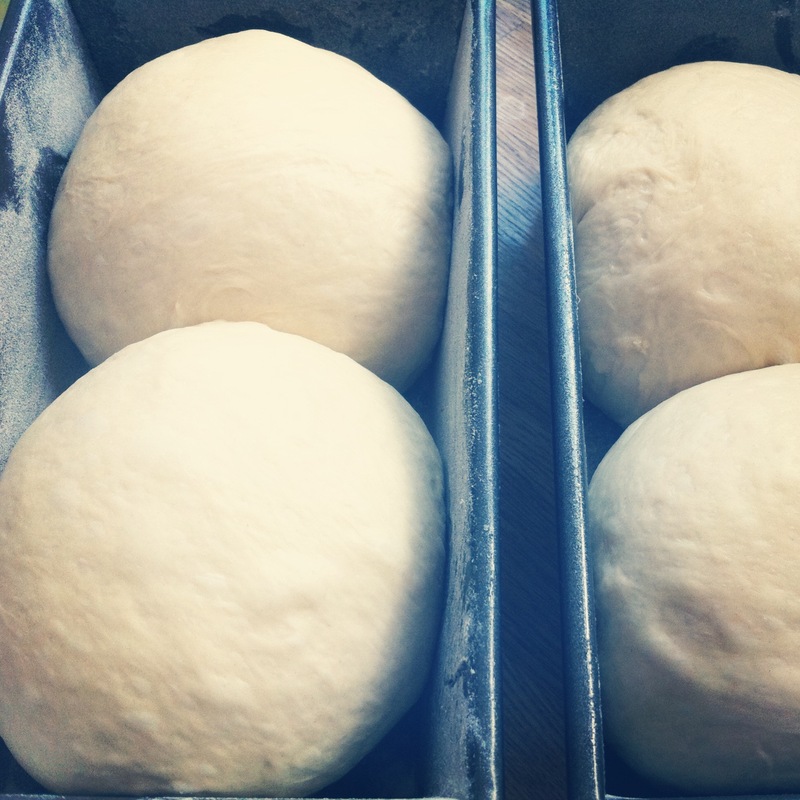 This process uses double the amount of yeast found in a homemade loaf. The higher yeast content, coupled with adding hard fats to stabilise the structure of the dough, (oh, and a plethora of chemicals!) then mixing at high speed produces a dough which is ready to bake in just 3 and a half hours. This short production time meant British bread could be mass-produced and, as a result, Britain is now one of the cheapest places in the world to buy bread. As well as being chock-a-block with additives and preservatives, Chorleywood bread, (if you can call it bread?) has also been blamed for the increase of people who find bread difficult to digest. Furthermore, the average supermarket loaf is likely to have been deep-frozen and defrosted prior to it reaching your kitchen table; and will no doubt have been made using flour from a variety of far-flung locations across the globe, including Russia, Canada and France. But who wants bread with a texture like cotton-wool and, quite frankly, as much flavour too? Certainly not me! And I’m not alone. Artisan bread is staging a huge renaissance with sales of luxury and speciality breads rising steadily year on year (according to Waitrose), which are made in comparatively miniscule batches and produced using traditional methods. According to ‘Paul Hollywood’, the lengthier the proving process, the tastier the loaf. This explains the lack of any character in packaged supermarket bread and the whole world of flavour to be experienced in home-baked and artisan loaves. Not to mention the huge joy and satisfaction of mixing, kneading and shaping your own dough and seeing it rise and bloom in the oven! Priceless! BunzBakes is now on Instagram! Don’t forget to follow me on Instragram @bunzbakes for lots more delicious home-baked snaps! I can post pics faster than I can write posts, so there will be many a pictorial delight to be had there! I have a personal account which I constantly fill with my baking photographs and I’m worried my friends think that is all I do! So @bunzbakes will now be the home of all my #freshlybaked #picsoftheday! The Best Baton: A Guide to Shaping. 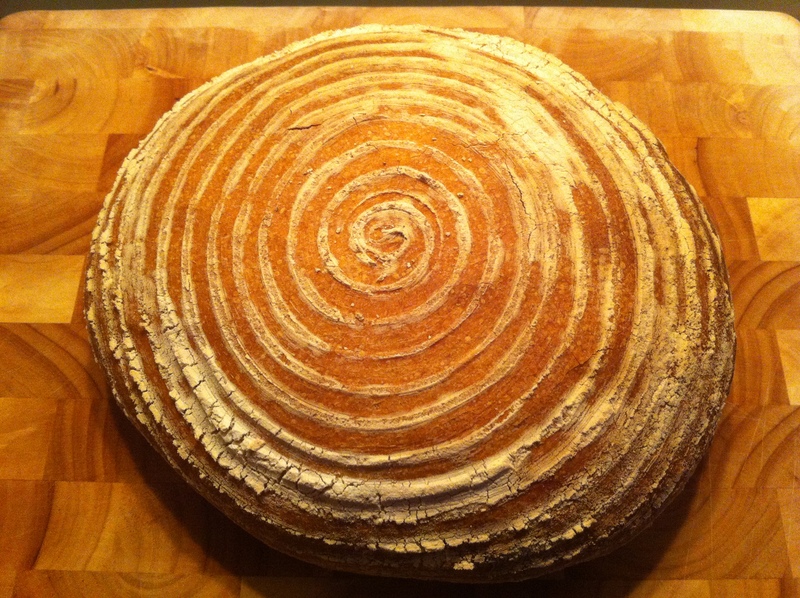 I have promised a post on shaping bread, so here’s the first of a large batch! I am baking bread for our work summer picnic next week and thought it prudent to do a test run to avoid disaster and the shame of turning up empty handed! I will post the recipe shortly, although you could look it up for yourselves (it’s another from the Nordic Bakery Cookbook, Miisa Mink), Rye Baguettes. Interestingly, and rather delightfully I thought, they have raisins in them and Miisa tantalisingly suggests they would be good with a slice of Brie, yes please! a) (prior to the steps shown) Once your dough has doubled in size for the first time, firmly press it down (or knock back) with your fists. Turn out onto a lightly floured surface. Divide into the number of pieces required by your recipe. Shape each piece into a smooth ball (not pictured) and place seam side down on a floured surface. Cover with a tea towel and leave for 10 minutes. Dan advises that this will produce a smooth ball which will give you a more even oval for shaping in the next step. Having left your ball/s of dough for 10 minutes, take one and flatten into an oval. This will create an almost pointed outcrop in the dough. Take this projection and fold it into the centre. Don’t be afraid to press down quite firmly so that the dough bonds together. Repeat steps 2 and 3 with the opposite edge of your oval. You will be left with a sort of canoe shape. Fold one of the long edges over onto the opposite edge and press down firmly to create a seam. Your dough will now resemble a sausage! Roll gently using both hands to elongate the shape slightly – I press down slightly harder with my outside two fingers on each hand to create the tapered ends. Remember that these batons will now be given a second rise, so don’t be shy when you are creating their pointed ends, as these will fatten up as they prove. Place on a lined and/or floured baking sheet and bake for the time specified in your recipe.